I want to start a thread about "high quality proxies", also known as fakes. There seem to be some terrifyingly good ones out there. I'm really hoping that someone can educate me about things like, how not to get ripped off, how to tell the difference, and anything else that I should know about but am too ignorant of to even know to ask. If anyone can help, I'd really appreciate it. You should pick up a jeweler's loupe which will allow you to look at the printing pattern on real cards. Once you look at real cards under magnification you'll get familiar with the types of pattern that these cards have. Some key points, the border, and all text should be crisp and solid black, and should not have the printing dots that the rest of the card will have. Many fakes lack clarity in the set symbol and text. There's a fairly recent guide on PucaTrade that points out some of these things. I've also seen pictures of fakes that have the rosette pattern on the white border which should never happen. You can also get an LED flashlight (I picked one up at the dollar tree) or use the LED light on your phone to see the density of the card stock and tell if it looks right. Some fakes are printed on the wrong type of card stock, and rebacked collector's edition cards are usually too thick/dark. Again compare to another real card from the same set. Some people go as far as to use a digital scale. I have never done this, and don't have any tips for you on the correct weight. A loupe and a flashlight should help you buy and trade with more confidence. There's also a black light test. Note that alternate 4th edition will fail the black light test. I'll second the recommendation for a jeweler's loupe. You can get some that also have an LED flashlight built in, so you have the tools to do two authenticity tests in one palm-sized device. There are a number of easy tests you can perform that will tell you right off if something doesn't seem right. First, run your finger over the surface, does it feel like a Magic card should? Most fakes are either too smooth or too rough. Notice all of the black text appears pixelated in comparison to a real card. You may have to zoom in to see it clearly. Those three tests can be conducted anywhere, and should tell you with a fair amount of certainty if the card is legitimate. Another you can do is the blacklight test. Shine a black light on the card in a dark room and see how luminescent it is. Check against a real card. @GHitchHiker So what did you do after you determined it was a fake? There are multiple Chinese sources and some are much better than others. 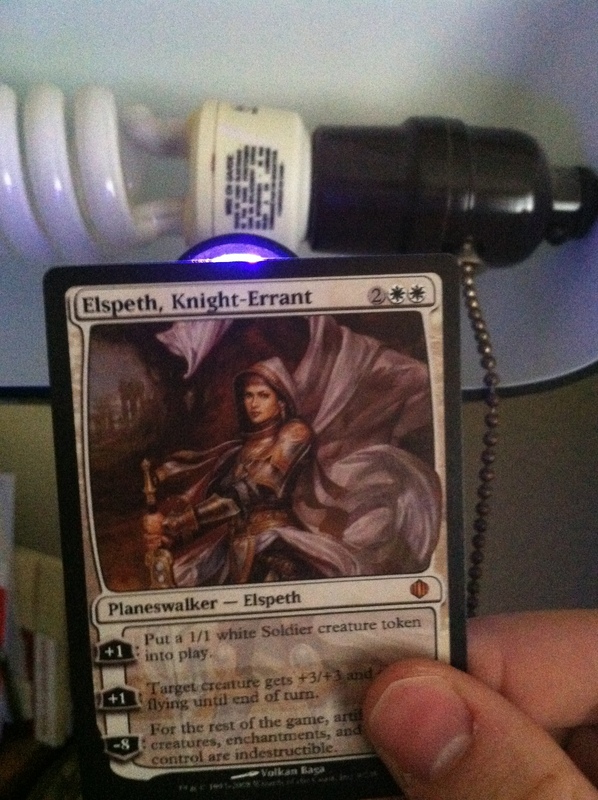 With most modern cards (like the Elspeth above), the difference is obvious. With the older stuff, it's not. I handed my father in law who deals in high-end baseball cards a mint Legends Sylvan Library and a Chinese Sylvan to see if he could tell the difference. He found one: the fake is too glossy. The internet has found a way around this: there are tested ways to simulate aging and break down the gloss. It's especially difficult to tell with Beta cards since Beta was such a crappy printing to begin with. I'll get high-res scans of a Chinese Demonic Tutor next to my Beta Demonic Sunday night or Monday. There's no meaningful difference in the printing. The light test is NOT reliable any longer. The Chinese can't get authentic blue core card stock, but they can get authentic black core from the same company WotC buys from. A card can't pass both the light test and the tear test, but are you really going to tear test the Black Lotus you just bought? Also, it appears that a new set of fake Beta duals and Unlimited power is out in the last two weeks. I would strongly urge anyone seeking to buy any card that might be from this new printing to familiarize themselves with what tests still work before making any major purchases. First off, thanks for sharing. That sub is quite alarming, but seeing the pictures of the new fakes and knowing what is out there is an important step in protecting yourself. Please when you scan your demonic tutors, also do a light test for me on both and upload some pictures. Personally I think that the light test is not completely devoid of value. It should not be your only test, but it not only allows you to spot bad fakes, but also the pattern of what I am going to call the glue layer (blue or black in fakes) is different on really old cards. I'll try to get pictures of this. I don't have access to fakes, but I can show you what I mean with a modern card vs an old card. I assume that all fakes are using modern card stock, and thus will have the modern pattern. I would like to confirm that by seeing what your DT looks like. Also the pictures I've seen of power from that sub look like they still have flaws. It's hard to tell at the resolution they post, but again, comparing side by side with a real card under magnification should show if this is correct. The text looks real crisp on them though, and that is scary. Personally I think they will have the hardest time replicating the older cards, but what you're telling me seems to indicate the opposite of that, and I'd like to see good ways to test if you can demonstrate them. I've dealt with hundreds of high end fakes and I haven't really found any test that works 100% of the time, other than just your gut feeling, and then closer inspection. Using an LED light will help with rebacks and some cards that just seem off. Using a loupe is great, but I have even found some fakes that look good under a loupe (but still looked off from afar). Blue core doesn't really work anymore either, and an LED underneath some older Green and Black cards will barely shine through. Having a side by side comparison is probably the best method, but even in modern print runs (tempest, etc), I've seen huge variation in color. I typically look at the expansion symbol, the font on the card, and then loupe the edges. On the high end stuff, you can trust the big stores, but on low end and mid range, I don't think they look too closely. It's cheaper for them to just refund your money when you find a bad card, then it is to sit there and inspect every card in their inventory. I've seen a really good Beta Sapphire and a really good Bazaar. The Sapphire was definitely fake (but was too transparent), but the Bazaar was very good and could have been real, but once again, something just seemed "off." Having Collector's Edition cards also helps with comparing old Alpha and Beta in my opinion. I am always weary of hard and fast rules around real vs fake when looking at the pixels through a jewelers lens. I had acquired a revised scrubland before eternal weekend from a reputable shop local to me. Maybe a month later I go to another local store with the intent to trade said scrubland toward an underground, and the owner immediately noticed something "off" about the card and busted out his Jewelers lens to inspect. Within about 30 seconds he said the card was a fake (a great fake, but fake none the less). Obviously angry, I intended to return to the store that sold me the card and demand my $$ back, then another patron of the store who claimed to know a thing or two asked to look at the card (I took his word based solely on my personal knowledge of his extensive collection) and he stated that the card was not a fake, but more likely from a different printer/print run from Revised. He and the store owner argued a bit and agreed to disagree. PS I decide to take this card to Eternal Weekend knowing that with the shear number of Dealers down there I would get my answer. I show up Friday early afternoon and immediately start going around telling each dealer that I have this card, don't know if its real or fake and want an opinion and a potential trade assuming its authenticated. Without naming names, I went to 6 dealers, and 4 said its real, agreeing with the gentleman who stated that it was from a different printer/print run, and two agreed with the store owner that the pixels were wrong and that it was a really good fake. Moral of my story, to this day I have no idea if this scrubland was real or fake...all I could go by was the majority opinion and I ultimately traded it toward some blue duals. I should add that I feel no guilt regarding this...I was honest and up front and each dealer did their due diligence. Be an informed consumer, and don't be afraid to do your homework before investing $1000's in cards but I am hesitant of hard and fast rules surrounding some of the more intricate aspects of card design and printing. Just to add to the "black layer last" point, legit magic cards appear to go through a 2-pass process (at least), where the four CMYK printing plates come down first, including black (K) to make a process 4-color black, and then rules text comes down on the black plate by itself during a second pass. The counterfeits run everything at once, including the text, which is why when viewed through a loop, you can often see the dot pattern on the rules text: it's a 4-color process black. It's probably also why the text appear thicker. There's also a dot pattern on the black border, which is a dead dead giveaway. This latter point makes me think wotc (or I guess Cartemundi) has a 3-pass process, where somewhere along the line they print the border as a spot color. Not all of them. Again, the counterfeiters vary in quality and some of them use a two-step process. @Topical_Island I created a Facebook group a while ago to provide help for people looking to authenticate their cards. In particular a member by the name of Travis King has been a tremendously helpful resource to many players who are not confident in their ability to authenticate cards. I haven't had much time to chime in my self lately but will if I see some discussion going horribly awry in terms of truthiness. So these cards are sold as "proxies". Are people actually playing in non-sanctioned events with these things? If so, do people know about it or not? Are people sneaking into sanctioned Vintage with "proxies"? I'm very curious. It came from Pucatrade, so I sent it to their in-house authenticity checking service and was given a refund. @Islandswamp The proxies I use at non-sanctioned tournaments came from a Chinese printer, it could very well be a similar source to where some of these counterfeits are coming from. Afterall, the only difference between a good proxy and a counterfeit is what you represent it as. 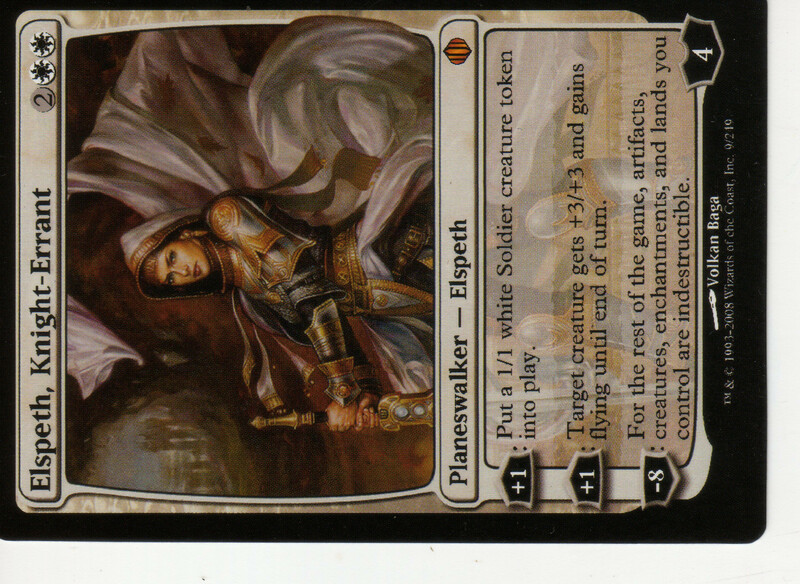 Edit: I can upload some scans of these proxies later if anyone would be interested in seeing them. @GHitchHiker color me interested... using at least a 2 step printing process. I believe this is part of why there was a clarification between the term "proxy" and "play test card" a little while back. The Chinese counterfeiters are using the term proxy. Fake cards like these obviously violate copyright laws. Play test cards (islands with things drawn on them) generally do not. If anyone is looking for really nice play test cards, check out the Wayne England prints that Mark Aronowitz has or commission an artist to draw something for you. Amy Weber makes some nice affordable time walks.